A group of College of the Mainland students attended Community College Day at the Capitol on Jan. 30. Students met with State Rep. Mayes Middleton and other lawmakers throughout the day and took a tour of the historic Capitol building. During the whirlwind trip, the group met with state lawmakers, toured the Capitol and watched over the Texas House of Representatives from the House gallery. This year’s Community College Day was coordinated by the Texas Association of Community Colleges. The COM students boarded a charter bus the evening of Jan. 29 and spent the night in Bastrop before heading to Austin early Jan. 30. The COM students as well as representatives from the other 49 community colleges in Texas convened on the south steps of the Capitol for group photos and a morning rally. COM student Elizabeth Urban, who serves as treasurer for the Texas Junior College Student Government Association, was recognized along with other TJCSGA officers. Before heading into the building, State Rep. Mayes Middleton, whose district includes College of the Mainland, joined the COM students outside. Middleton, a supporter of community colleges, shared his views on higher education, especially the need to offer dual credit to all Texas students. 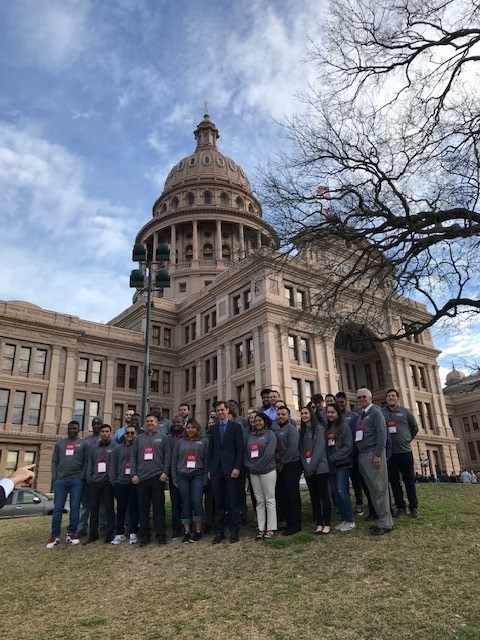 Once inside the majestic building, students formed teams to visit the offices of members on the House and Senate Higher Education Committees as well as local elected officials: State Sen. Larry Taylor, State Rep. Greg Bonnen and Middleton. In the afternoon, the group took an official tour of the Capitol, including walking onto the House and Senate floors. Daniel Warner, a higher education staff member with Sen. Taylor, met with the students in the Sam Houston Building for a discussion on all things higher education, including state funding, dual credit, corequisite, Collegiate High School and workforce development. The day ended on the north steps of the Capitol where Middleton joined the group for a recap. Aside from the students, others from COM who attended were President Dr. Warren Nichols, Vice President of Fiscal Affairs Clen Burton; Tige Cornelius, Kari Starz and Greg Benefield with Student Life; Student Government Advisors Doug Alvarez and Sean Skipworth as well as marketing and public affairs team members, Bob Wright, executive director, Scott Turnbough, photographer and Ruth Rendon, communications officers, who organized the trip.